Few situations in a cat or dog’s life are as stressful as amputation surgery, recovery and learning to get around on three legs. It’s not uncommon for some animals to show signs of stress after amputation surgery, like urinating outside the litter box, displaying anxious behavior in familiar situations and more. It might be tempting to ask your vet for a sedative or even Prozac, but why not try an all-natural anxiety remedy first, like the Feliway Diffuser. We learned about Feliway Diffusers when Progo, a 16-year old cat and brand new Tripawd, was having litterbox woes. He refused to use the box so his people reached for an all-natural stress remedy: pheromones! So what is this invisible thing called “Pheromones”? According to Feliway, “Pheromones are chemical signals which are widely used for animal communication. When emitted by one individual, pheromones are then detected by other individuals from the same species. The messages conveyed by the pheromones affect behavior. Many veterinarians have embraced synthetic pheromones, recommending them for use at home as well as in cat carriers. 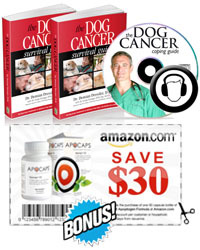 The success of these products has cut down on expensive sessions with animal behaviorists. “We’re seeing far less of the common behavior problems such as urine spraying than we saw 10 or 15 years ago,” says Gary Landsberg, a leading veterinary behaviorist in Toronto. Instead, he adds, “we’re seeing much more difficult, pathologically anxious, phobic or compulsive animals.” In those cases, he often recommends pheromones, along with psychotropic medication and behavior therapy. Like any behavior therapy, what works for one animal may not work for another. Treating anxiety and stress takes patience and time to see what will make the best impact so you new Tripawd can lead a happy, healthy life. If one type of holistic anxiety remedy doesn’t work like you thought it would, try another. Odds are pretty good there is a product out there that can ease your dog or cat’s transition to life on three legs. Thanks for doing all your Amazon shopping through this blog. A small portion of sales goes toward helping the Tripawds Nation stay online!